How do I add and manage sub-accounts and distribute my main account's credits? Customers who purchase 1,000,000 or more credits unlock multi-tier account privileges, which allows you to add multiple child accounts and distribute credits to them through the originating, or parent, account. This feature is intended for organizations with multiple use cases across multiple countries, where it's useful to be able to create accounts for specific organizational branches and manage them from a central account. To add a child account, first navigate to your account's home page. Scroll to the 'Your organization is...' section and click the 'Manage Organizations' button. Click the 'New' button in the top right corner of the page. Select the 'Transfer Credits' option from the gear icon menu in the top right corner of the page. 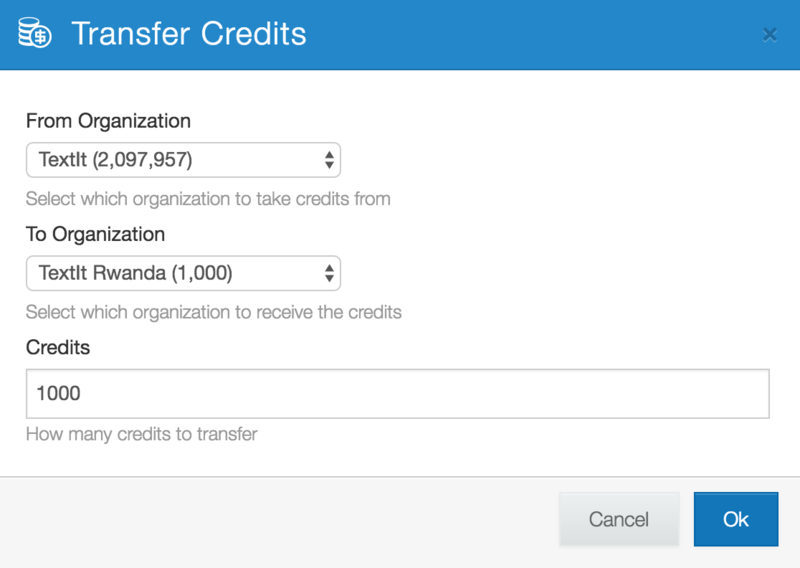 On the resulting modal, select the origin and destination accounts, then enter the amount of credits you'd like to transfer. To enter one of your child accounts, simply click the new account icon in the top right corner of the screen and select the account you'd like to enter.